Rain continues to push southeastward tonight along and behind a cold front that is moving into into Northwest Alabama at this time. Temperatures are still in the 50s mostly across Central Alabama this hour. It is 49F at Alex City and 47F at Fort Payne. 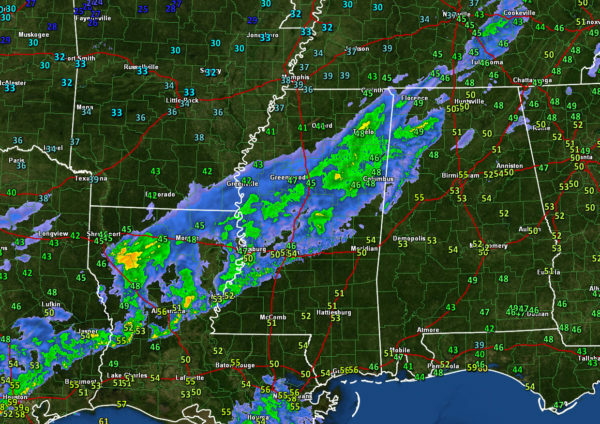 The lead cold front has reached Tupelo and Muscle Shoals. Winds have shifted to northwesterly at those stations. The arctic air is pushing into western Tennessee and Central Arkansas at this hour. It is now 30F at Searcy, AR, and 32F at Dyersburg TN. We are still waiting to see if the cold air can catch up to the precipitation. HRRR: The HRRR model has trended downward, limiting most areas to a dusting, but giving up to one inch over some western counties, including Sumter and Greene County, as well as the higher terrain of eastern Alabama, including parts of Talladega and Clay Counties. 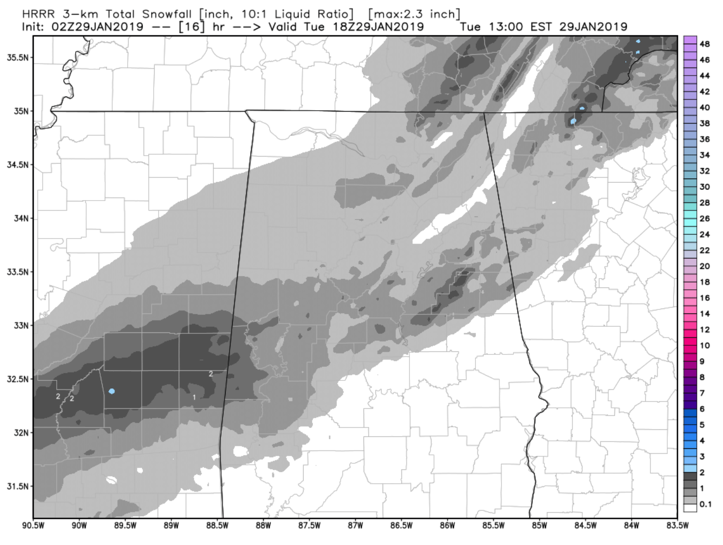 NAM 3KM: The 3km NAM still paints a wide swath of 1-3 inch amounts generally along and south of the I-20 Corridor, with heavier snow for places like Sumter, Greene, Tuscaloosa, Jefferson, Talladega, Clay, and Cleburne Counties. 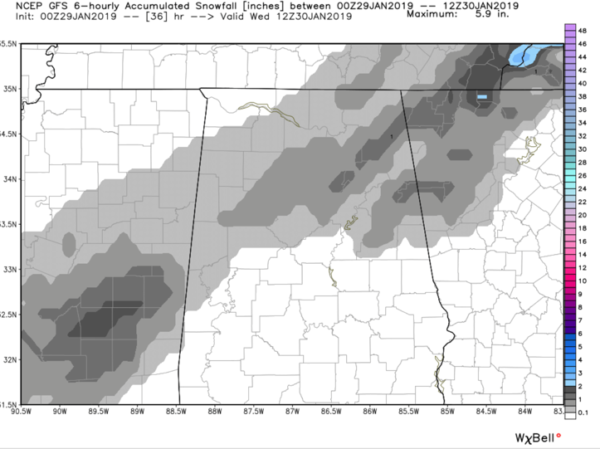 The GFS now depicts much less snow across Alabama, showing the heaviest amounts across Central Mississippi. 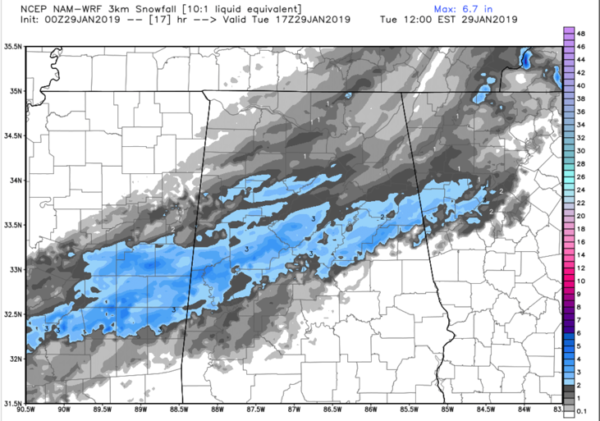 It shows w widespread dusting, but limits the amounts near one inch to a smaller area from northern Fayette and Walker Counties across northern Jefferson, Cullman, Blount, Etowah and DeKalb Counties, with the highest amounts over the higher terrain of Northeast Alabama including places like Gadsden, Oneonta, and Fort Payne. The SREF plume for snowfall at Birmingham has backed off a bit as well, with its mean output standing around 1 inch now. The winter storm warning remains in effect for areas generally north of a line from Coffeeville to Thomaston to Centreville to Calera to Sylacauga to Roanoke. A winter weather advisory covers areas south to Washington and Monroe Counties northeastward to Montgomery and then over to Chambers County. So, we are monitoring the situation carefully and will have frequent updates through the night.